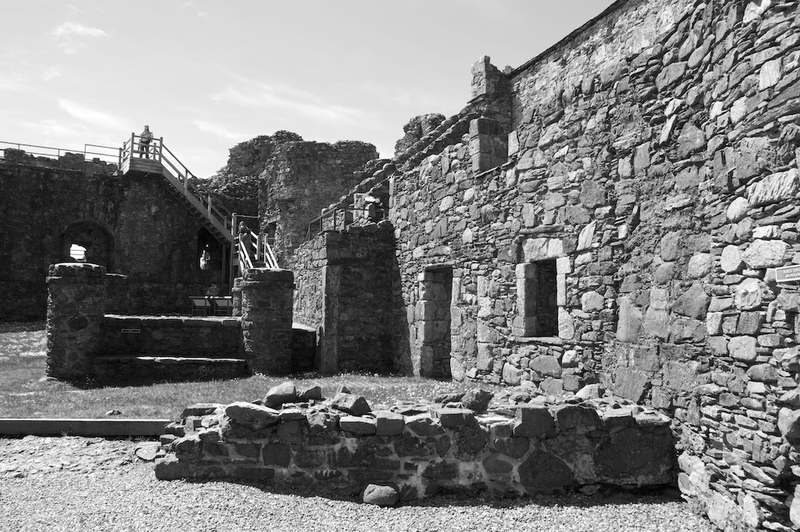 Described by Historic Scotland as a “brute mass of masonry”, Dunstaffnage Castle rises up out of a solid lump of dark grey conglomerate rock, looking almost as if it has grown out of the ground itself. It’s a solid monster of a place, built for defence and defiance. You get the distinct impression that if you were approaching this castle in the 13th century, it wouldn’t be the kettle they’d be putting on to boil – it would be the buckets of tar. At first glance, there doesn’t even seem to be an entrance: it only becomes visible when you walk around to the eastern side, past the small ticket shop which stands in the grounds. Somewhat incongruously, three dormer windows peer warily down at you over the curtain wall as you make your way over the grass. With places like this I usually start with the earliest date and work forwards – but this time I’m going to start with those windows, partly because I feel as if I’m being watched. From the inner courtyard, it becomes clear that they belong to a four-storey tower house, one that has been modified several times since its earliest incarnation in the 13th century. Around 1500 the original two-storey gatehouse was replaced with a square tower, and two further floors were added about a century later. This tower house was – and still is – the residence of the Captain of Dunstaffnage, although he does not live here permanently. His title comes at an intriguing cost: I’ll tell you more about this presently. It’s likely to have been Duncan, grandson of the legendary Norse-Gaelic warrior Somerled, in around 1220 (other sources suggest that the builder was Duncan’s son, Ewen). Duncan was the son of Dubhgall, and their descendants were known as ‘MacDougall’ or ‘McDougall’, the first Lords of Lorn. 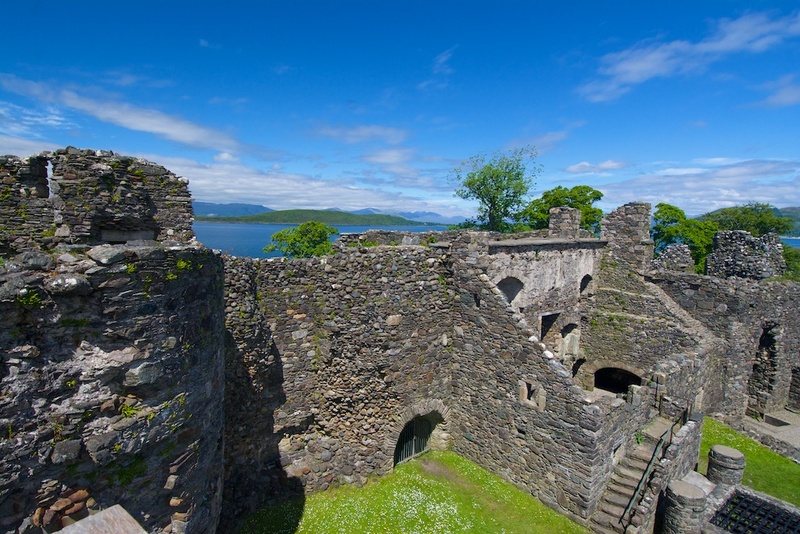 Dunstaffnage occupied a commanding position on the west coast, with sea trading routes to all the islands and further afield to Ireland and Norway. But there are strands of legend that go back another 600 years, to the kingdom of Dalriada and the enigmatic Stone of Destiny. 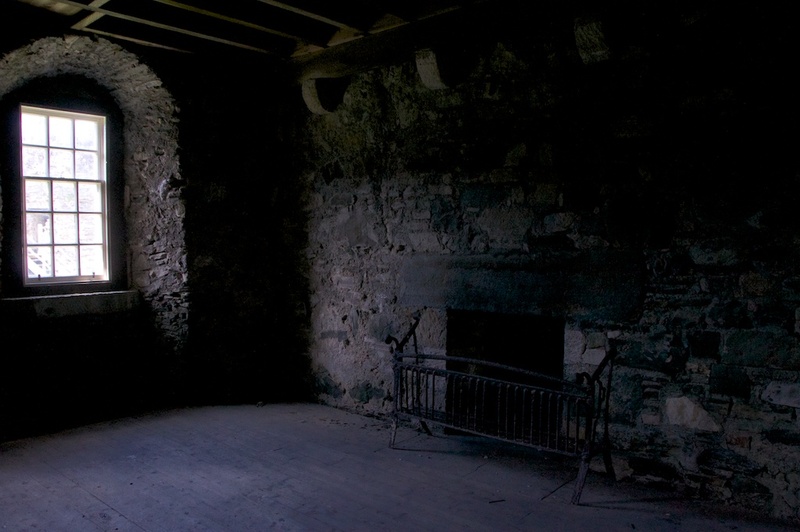 Was this powerful relic – the traditional throne of Dalriada’s kings, now confined to a darkened chamber at the heart of Edinburgh Castle – once held at Dunstaffnage? All we have to go on are fragments of stories and our own imagination. 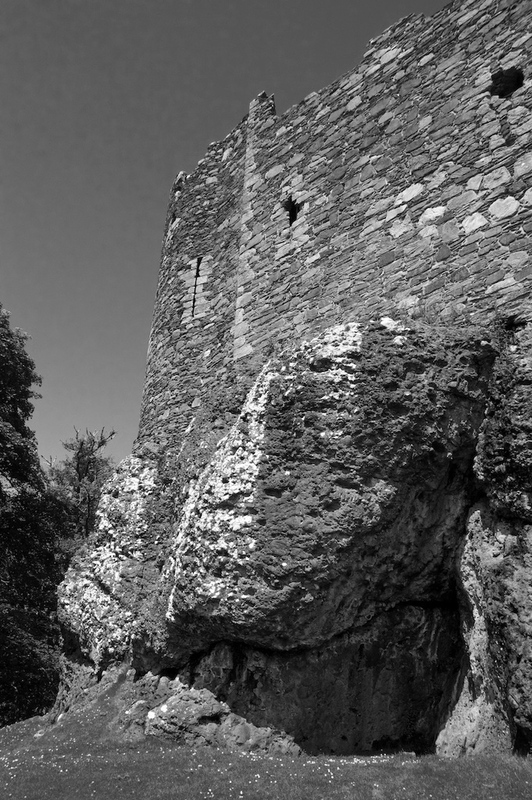 When you gaze up at the impossible ramparts of Dunstaffnage from the foot of its base rock, you realise that its builders had to compromise themselves slightly with the design, even if they compromised with nothing else. The shape of the castle was governed by the shape of the outcrop upon which it was placed, meaning that the towers, which would normally have jutted out at each corner, were contained partly within the curtain walls. I still wouldn’t have wanted to be the builder who had to explain to Duncan MacDougall that his ground plan wouldn’t be quite as extensive as he at first thought. With their strong Norse ancestry the MacDougalls owed allegiance to Hakon IV of Norway. They snapped their fingers in the face of Alexander II of Scotland, which may not have been a good idea. 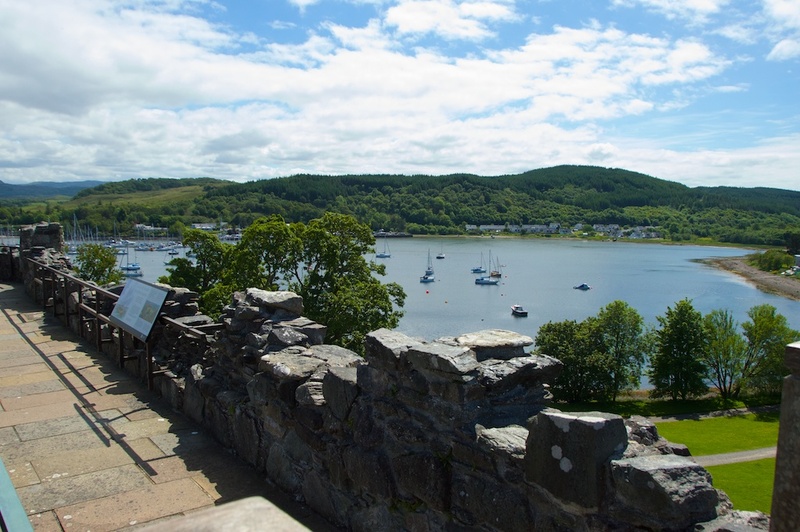 In the 13th century Norway controlled much of the coast of Scotland and Ireland, but in July 1249 Alexander reckoned that he would set the matter straight, and gathered a fleet of ships in Oban Bay, ready to attack Dunstaffnage Castle. Having seen Oban Bay in all seasons and all weather, I would still love to have witnessed this sight, of its sheltered waters bristling with Scottish galleys. But then disaster struck. Alexander, it turned out, had had a dream. In it, he was visited by not one but three saints: St Olave, St Magnus and St Columba. All of them advised him gently but firmly to abandon his mission and go home. If Alexander had listened to these medieval versions of Gloria Gaynor, everything might have been fine. But unfortunately, he didn’t. As he strode around the island of Kerrera in Oban Bay, possibly waiting for the wind to change, Alexander was struck down with a mysterious illness. Within hours he was dead. His glorious army, eager and poised for combat, had to prepare instead for his funeral. He is remembered on Kerrera in the place name of Dail Righ, ‘the King’s Field’, which leads down to Horseshoe Bay, just south of the landing for the present-day ferry. 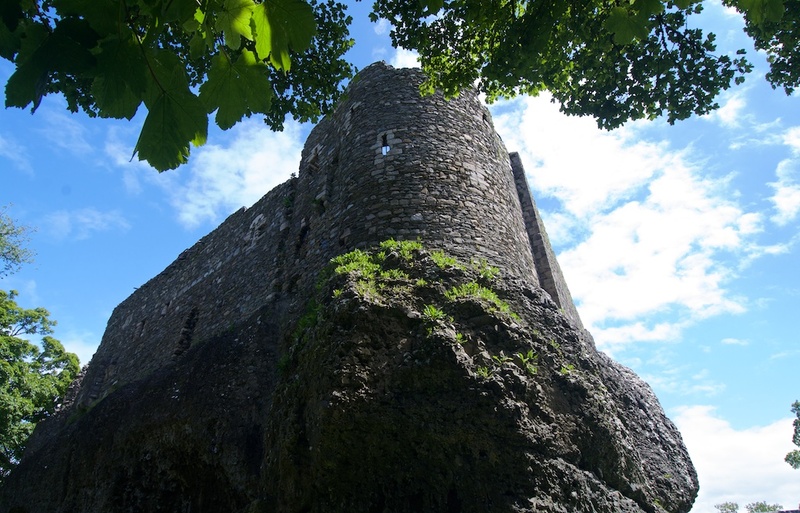 So the MacDougalls of Dunstaffnage lived to fight another day – not that they would have been particularly worried, with such a stronghold to protect them. But in 1309 they met their match in the shape of Robert the Bruce. 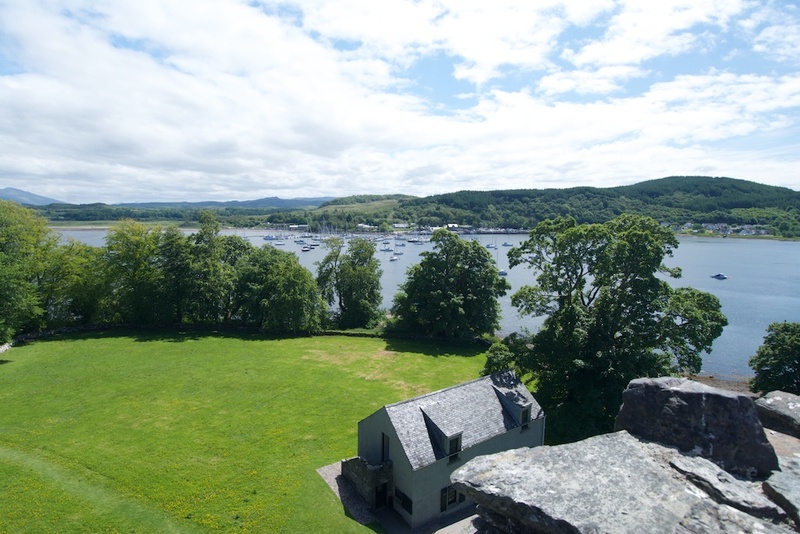 After a battle in the Pass of Brander, at which the MacDougalls were defeated, the king laid siege to Dunstaffnage Castle and subsequently captured it, appointing as its Constable the Chief of Clan Arthur. 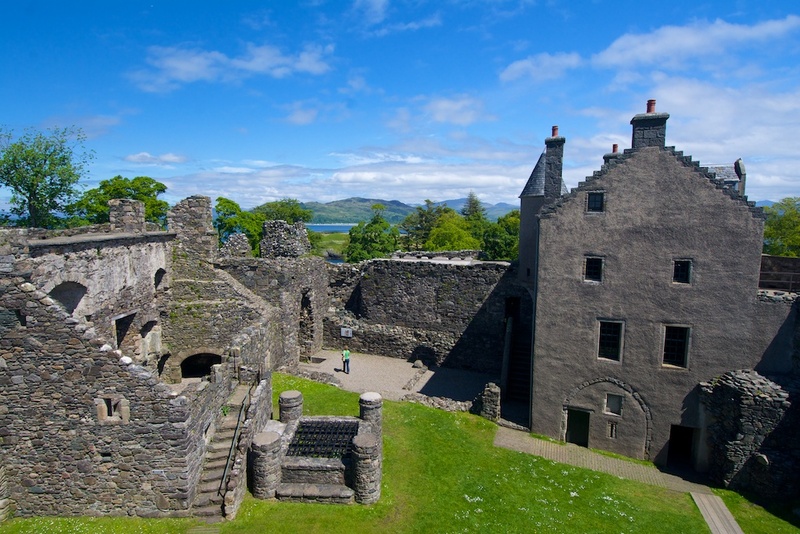 In 1470 Dunstaffnage was granted by James III to Colin Campbell, 1st Earl of Argyll. 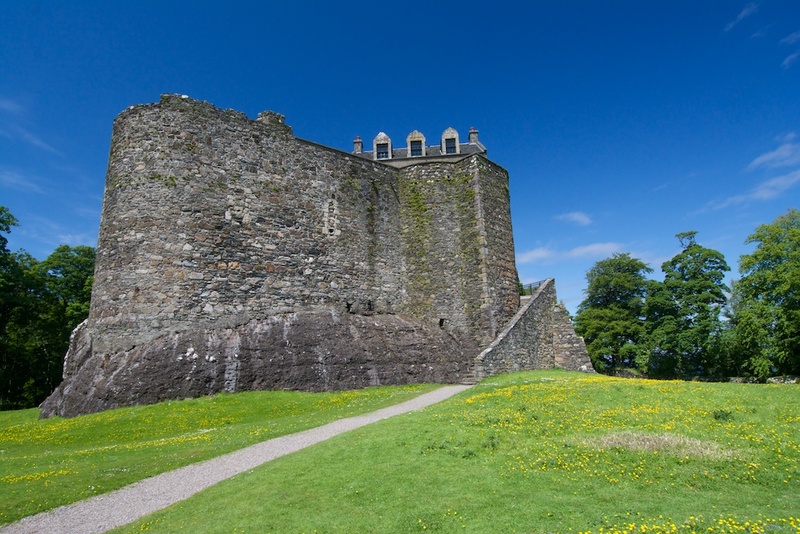 The Earl created a new title, that of Hereditary Captain of Dunstaffnage, which he bestowed upon his cousin; and his descendants still hold that title today, in an unbroken line that stretches back over 500 years. In my much-treasured book, ‘Keepers – the Ancient Offices of Britain’, I was interested to read that, under an archaic law, the Captain is obliged to spend at least three nights of every year in the Castle. It’s not the most enticing prospect, but it is obviously no hardship for the present incumbent, Michael Campbell, who is photographed by a blazing log fire, barefoot and wrapped in a tartan blanket, with a wee dram in his hand to fortify him against the noisy stumblings of the castle’s “heavy-footed ghost”. 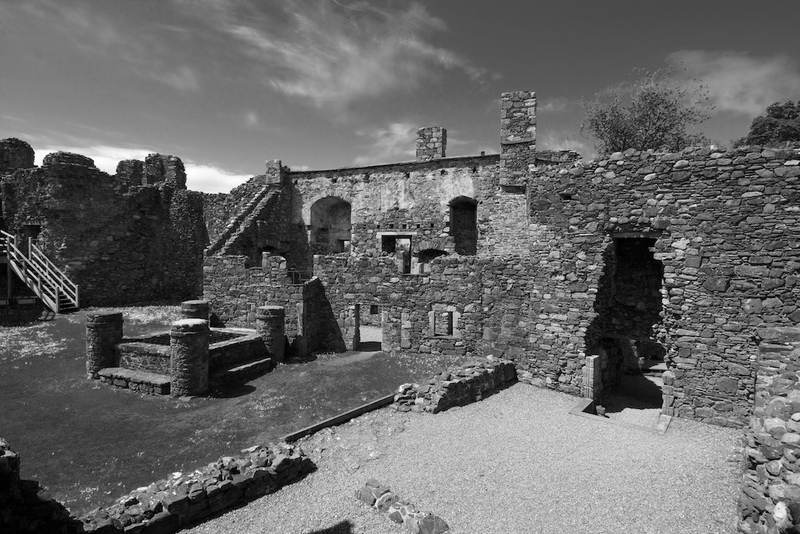 So whose restless spirit stalks the ramparts of Dunstaffnage? In some reports, this supernatural inhabitant takes the form of a lady dressed in green, and her appearance is said to herald news of either joy or sadness. It would be most helpful if she could indicate which it was. Another source says that the presence is that of a ‘gruagach’, something akin to a hobgoblin or a brownie, who used to help around the house and may be unaware that it is no longer occupied. 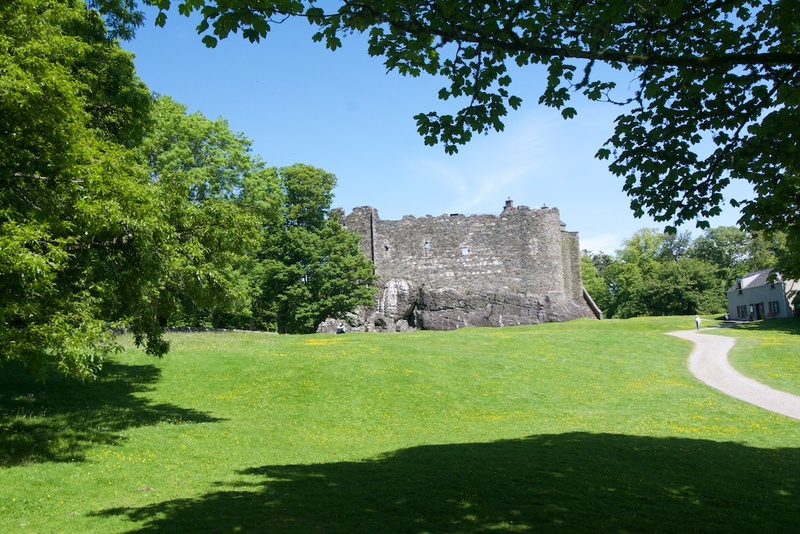 Dunstaffnage was occupied by government forces during the Jacobite uprising of 1745, and Flora MacDonald was imprisoned here in 1746, after she had successfully assisted Bonnie Prince Charlie to escape from Benbecula to Skye. She may have been held in the ‘new house’ in the courtyard, built in 1725 (the remains of it are seen on the right of the photo, above). The structure in front of it is a well, surrounded by 19th century stonework. 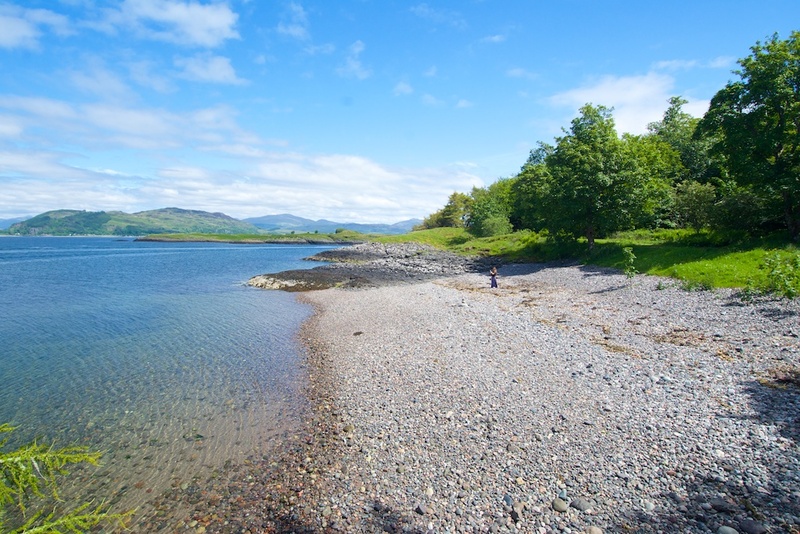 “Galleys were beached in Dunstaffnage Bay…. a ‘noost’ (old Norse) was a simple form of dry dock where carpenters could work on a damaged birlinn.” Historic Scotland. Cannon recovered from wrecked ships of the Spanish Armada were once mounted on the ramparts. Above: A short walk through the woods brings you out at this pebbly beach. 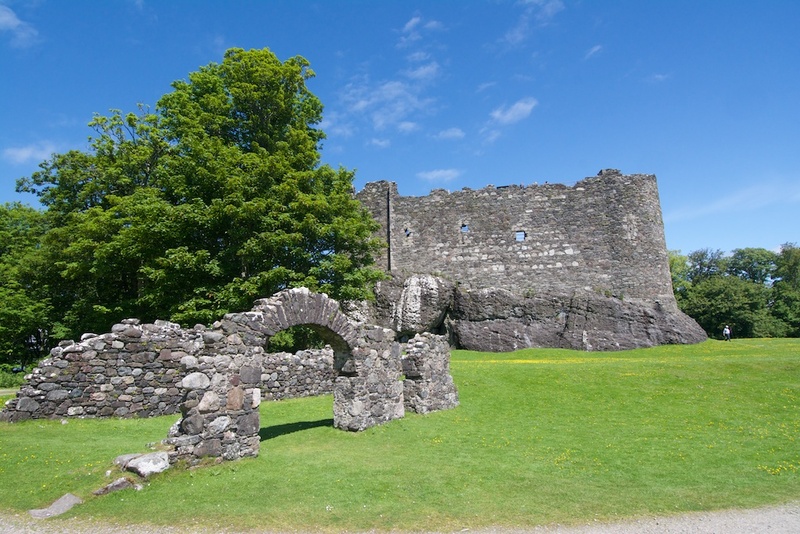 The name of Dunstaffnage is believed to come from the Gaelic word ‘dun’, meaning ‘fort’, and the Norse ‘stafr nis’, meaning ‘headland of the staff’. 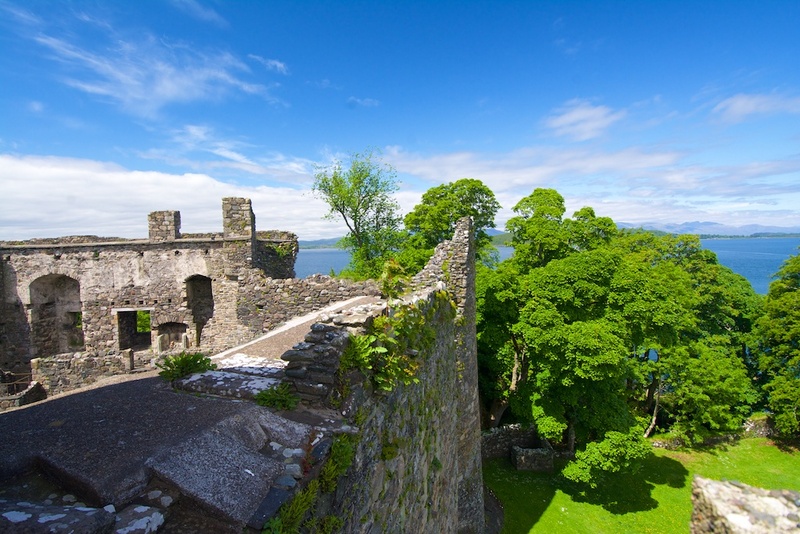 Dunstaffnage is an awe-inspiring place to walk around, and its ramparts give far-reaching views on all sides. 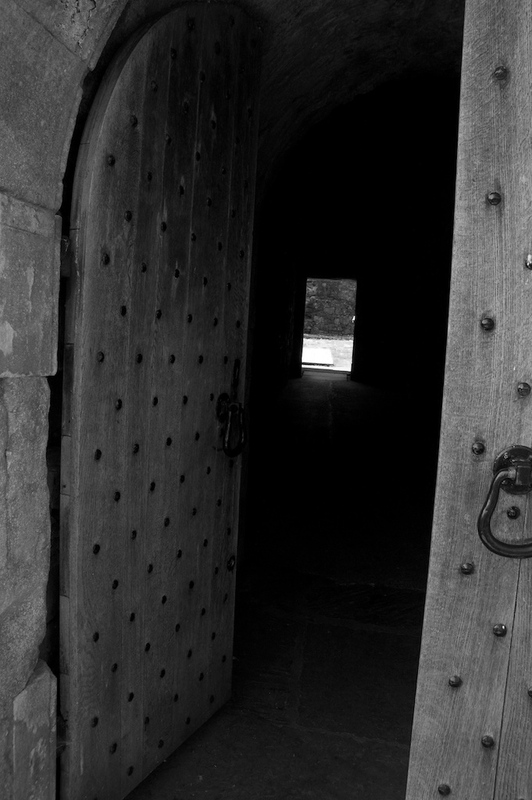 There was quite a difference in atmosphere between this visit – in June, when all the above photos were taken – and our first, on a cold evening in November, when the castle was about to be locked up and not a soul was stirring apart from the caretaker. I’m including an album of these images below, for contrast. Somehow, I think it looks best in the near-twilight, against a moody sky! Do you agree? “King Alexander, then lying in Kiararey Sound, dreamed a dream, and thought three men came unto him. He thought one of them was in royal robes, but very stern, ruddy in countenance, something thick, and of middling size. Another seemed of a slender make, but active, and of all men the most engaging and majestic. The third, again, was of very great stature, but his features were distorted, and of all the rest he was the most unsightly. They addressed their speech to the king, and enquired whether he meant to invade the Hebrides. Alexander thought he answered, that he certainly proposed to subject the islands. The genius of the vision bade him go back, and told him no other measure would turn to his advantage. The king related his dream, and many advised him to return, but the king would not; and a little time after he was seized with a disorder, and died. The Scottish army then broke up, and they removed the king’s body to Scotland. * The Hebridians say, that the men whom the king saw in his sleep, were Saint Olave, King of Norway; Saint Magnus, Earl of Orkney; and Saint Columba.” (Norse Chronicle of the Expedition Against Scotland). 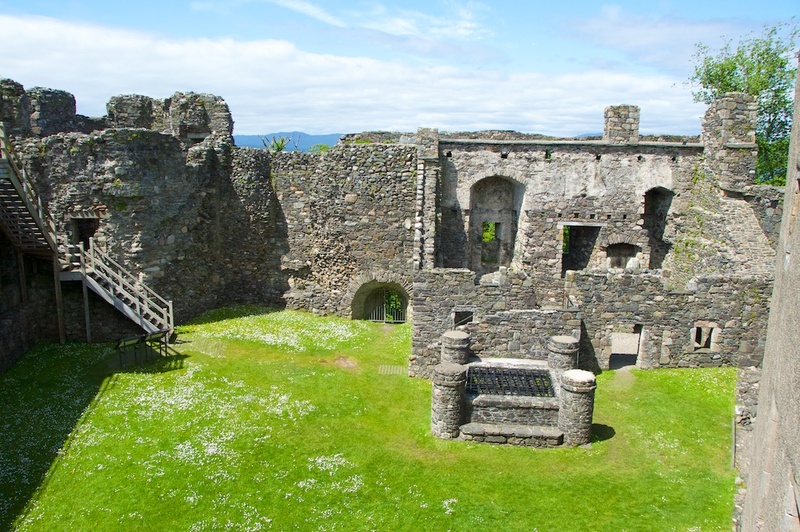 Dunstaffnage Castle can be found at Dunbeg, a few miles north of Oban. The property is maintained by Historic Scotland. It is open all year, and admission fees apply. 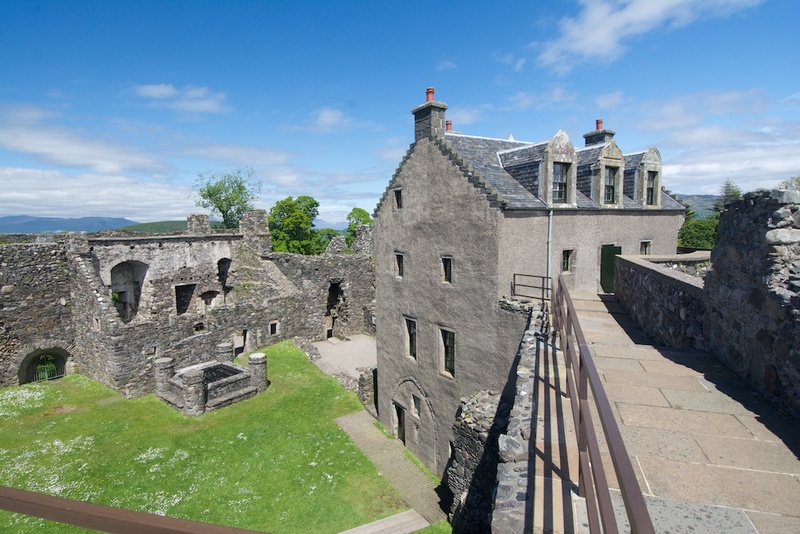 See Historic Scotland’s website for detailed visitor information. I like the sunny photographs, but I agree with you that the castle looks particularly intriguing against a gloomy sky. Those dormer windows look most peculiar viewed from below, I had no idea what to expect inside. I’m looking forward to learning about the Captain, as it seems remarkable that anyone would live there now, even only occasionally. I wonder if he’s seen the green lady himself. That pebbly beach looks beautiful although I associate that sort of terrain with midges. Thank you, Lorna! Yes, I do agree with you – some castles look best with a gloomy sky, and Dunstaffnage is one of them! I’m pretty sure the Captain of Dunstaffnage is familiar with the resident spook of the castle but she doesn’t seem to bother him overmuch. Yes, it’s a beautiful little beach down there! Not too many midges then, luckily. But that was before we had all this rain! What magnificent photos and what a story! All of the intrigue, including ghosties and goulies and things that go bump in the night! I agree, while the sunny pictures are gorgeous, the gloomy skies somehow suit the stories associated with the castle! Thank you very much, Michael! I don’t think I’ll ever stop being excited and inspired by the stories attached to these places. 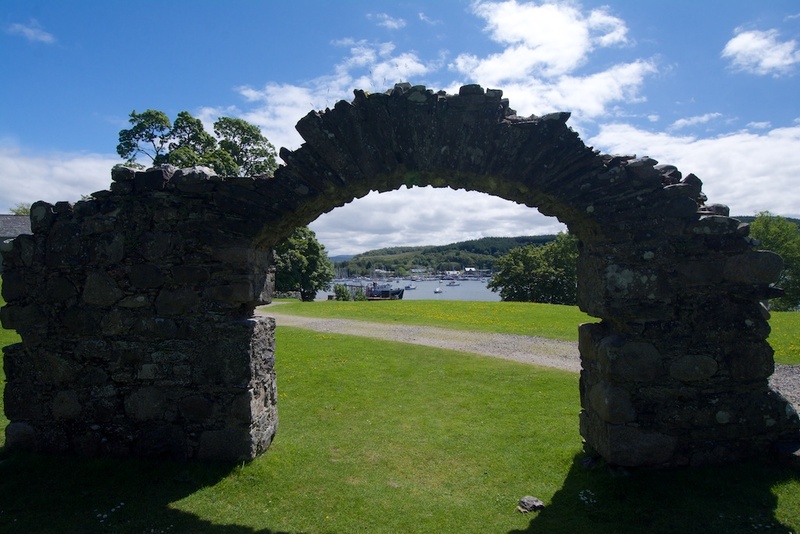 I do agree with you about the weather – the sunshine seemed totally out of keeping with the nature of Dunstaffnage! Love your blog! This is a great, informative post! Thank you, Lynne! 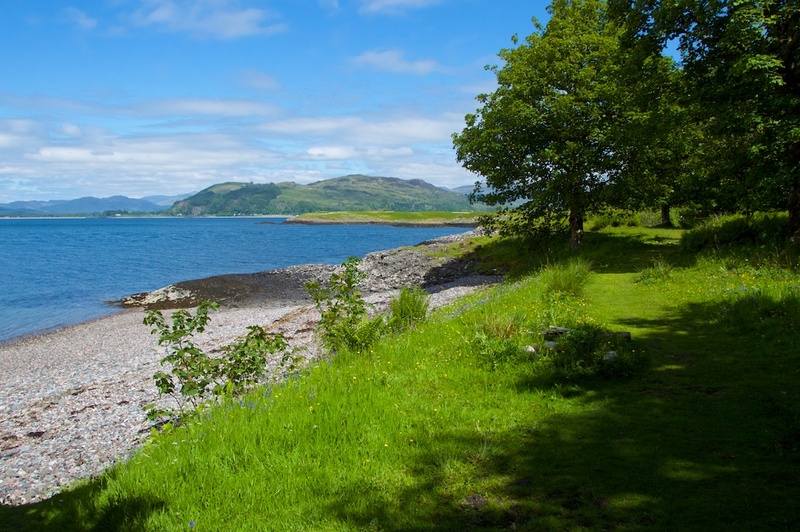 I know what you mean – we have been driving past Dunstaffnage for years, literally, and only visited it just recently (if you discount the walk around it a couple of years ago when we didn’t go inside). Thanks for posting Jo, so far have only commented previously on Stone of Destiny on your Dunadd post, I visited Dunstaffnage about three years ago and clocked the Stone of Destiny story straight away, noticed they referred to it as Stone of Jacob on the castle texts. Also, I made the connection between the Stone having been kept on Iona in the west and having to be moved east to Scone after Alba was created from the 2 kingdoms. Dunstaffnage would have been needed as safe place to keep the stones on its way east, even perhaps where it was first landed after sailing round from Iona, after all, no easy Road up from Oban back then. Thank you, Thomas! The whole thing about the Stone of Destiny, or the Stone of Scone, or its various other names, just fascinates me. Yes, I had seen it described as the Stone of Jacob, and then you have the whole ‘Scota’ story about the migration from Egypt to Ireland. The position of Dunstaffnage does make sense when you think about it, that’s a good point, and it was much easier and safer at that time to do as much travelling as possible by sea. Lots of great photos of such a well-preserved castle, Jo! Thank you! Yes, Dunstaffnage very well preserved, considering its age! One of my favourite parts of Scotland, too. I know the feeling, Scott! And if you’re away even for a few days (like I’ve been just recently) it’s overwhelming! 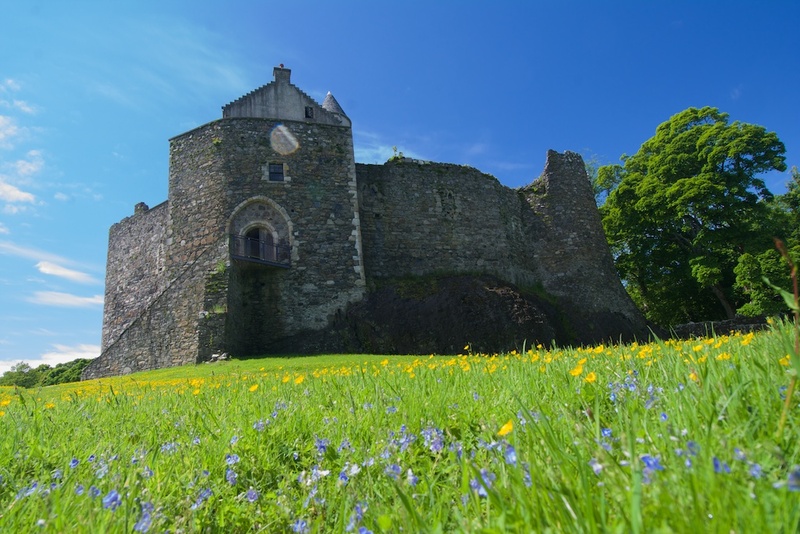 🙂 Thank you very much – yes, Dunstaffnage is well worth a visit, and all the countryside around there is just so photogenic.